In her highly anticipated new book Nothing Says a Good Day Like A Divorce…If you prepare for it! : A Step-By-Step Guide to Preparing for Divorce, Helen M. Dukhan, Esq., LL.M. 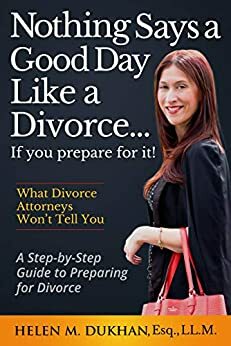 takes her audience step by step through how to prepare for any divorce, generously giving the reader information that divorce attorneys do not want them to know. Nothing Says a Good Day Like a Divorce…If you prepare for it! gives the reader the quintessential method for taking control over the divorce process, their life, their family, their wallet and their future! While Dukhan thoroughly explains the importance of preparing for divorce, most of the guide is devoted to showing readers how 4 simple steps can speed up the divorce process, reduce litigation costs, and set them up for success both during and after their divorce. Nothing Says a Good Day Like a Divorce…If you prepare for it! is a must-have simple but proven effective handbook that will enlighten, empower, and set up the reader for a future of proclaiming: NOTHING SAYS A GOOD DAY LIKE A DIVORCE!! WHO THE BOOK IS FOR: For any one that has decided to get a divorce or is on the receiving end of their spouse’s decision to end the marriage. A fast and simple-to-follow read brimming with wisdom and easy-to-accomplish exercises and tasks that will guide you down the path to a brand-new chapter of your life. A MUST READ FOR ANYONE THINKING ABOUT DIVORCE OR GOING THROUGH DIVORCE: The author puts at your fingertips the knowledge she has amassed over the last 15 years of practicing family and divorce law. Gifting you with priceless secrets other divorce attorneys do not want to share. The method in Nothing Says a Good Day Like A Divorce…If You Prepare for It! divulges her actual process for preparing her clients for divorce, empowering them through divorce, and securing their present entitlements and their future. WHAT YOU CAN EXPECT TO LEARN: Nothing Says a Good Day Like A Divorce…If You Prepare For It! illustrates the tested and proven effective formula for preparing for divorce, consisting of the following steps: getting organized, gaining access to funds, forming the proper support team, and forming the proper mindset. Readers will gain the benefits of Dukhan’s holistic approach to preparing for divorce, which will teach them to control their emotions in order to make the right strategic decisions necessary to protect their interests and secure their future. TRUE VALUE OF THIS BOOK: Nothing Says a Good Day Like a Divorce…If You Prepare For It! is like having a Divorce attorney provide you with critical consulting services at practically no out of pocket cost, and as a result saving you thousands of dollars on legal representation, reducing your stress levels, speeding up the divorce process, giving you an advantage over the outcome of your case, and giving you the tools to maintain control over the divorce process, and secure your future, leaving you celebrating: NOTHING SAYS A GOOD DAY LIKE A DIVORCE! ABOUT THE AUTHOR: Helen Dukhan is changing the way the world thinks about divorce! The founder of HD Family Law – The Law Offices of Helen M. Dukhan, Esq., LL.M. has devoted her entire legal career to representing individuals during their divorce and family law matters, in New York and New Jersey, consulting for individuals throughout the country, especially with regard to how to best prepare for divorce allowing them to ultimately take control over the process and their future, and empowering divorcees through the Non-Profit Organization she founded, Sunset 2 Sunrise. Dukhan shapes today’s conversations about divorce, transforming them from pessimistic negative thinking conversations to optimistic positive ones. Professionals in the field have often been enamored by Dukhan’s enthusiasm for divorce, as a means of rebirth and reclaiming of one’s identity, as a reason for celebration rather than sadness, in an almost contagious sort of way. NOTHING SAYS A GOOD DAY LIKE A DIVORCE! 5.0 out of 5 starsEasy to understand and Helpful! When reading Helen's book, I realized that we plan and prep for weddings for months - even years - yet in divorce, some of us jump right in fully unprepared. That makes no sense! The divorce process finds so many people scared, vulnerable and out of money! This book shows that if you prepare yourself, you will actual come out of the process MORE confident, empowered and should reach an outcome that actually BENEFITS your family - not destroys it. What an amazing idea. I would recommend this book to anyone contemplating a divorce. In reading it, you may even come to discover this is not the stage you are at. Before you spend a nickel on a lawyer, Buy This Book! BRAVO! What an important read. 5.0 out of 5 starsThe Best Divorce Guide on the Market! No matter how much society has progressed, the connotations behind the word "divorce" still exist. This guide shows those who are currently in the process, contemplating their next steps, or just want to gain knowledge in the area that it doesn't have to be exhausting (physically, mentally, emotionally, and financially). It breaks the process of divorce down into different steps, giving the reader space for personal notes in order to reflect their specific situation. No one situation is the same as the next, and this guide has the ability to help those even in the most complex cases. When dealing with such a life changing decision, it is normal to want to rush to be first to file papers, the first to hire the best possible attorney, the first to show that you're the better person in the situation. However, before doing any of that, please take the time to read this guide. The knowledge inside indescribably valuable and you'll be leaps and bounds ahead in the process when you decide to take the jump. This book is a must read for anyone thinking about getting a divorce. It’s a step by step guide on preparing for a divorce, the smart way. This book lays out every step in a clear, concise manner. The author has 15 years of experience in divorce and family law and it’s obvious she knows all the ins and outs to a divorce. If you’re planning on getting a divorce, be smart and READ THIS BOOK! 5.0 out of 5 starsEverything you need to know! This book was amazing, so informative and comprehensive. When considering a divorce there is so much to think about and it seems so overwhelming. This book tells you every single thing you need to do. The author is great, with superb advice and a friendly tone. A must read! Helen provides a detailed and practical overview of the issues involved in divorce. Focusing on both major areas of a divorce, the personal/emotional and the business/legal, Helen explains clearly the most important issues facing those considering or faced with separation. Worth reading... then re-reading!